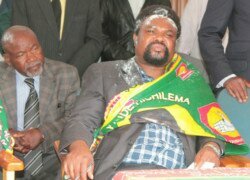 CANISIUS Banda is still a member of the United Party for National Development (UPND) and reports that he has resigned are nothing but speculation, Charles Kakoma has declared. Mr Kakoma, who is UPND spokesperson, said Dr Banda had neither relinquished his position as vice-president for political affairs nor had he quit the party and was, therefore, still a member of the opposition party. Mr Kakoma said as far as the UPND was concerned, the resignation of Dr Banda was simply social media speculation and poetry as the opposition party had not received any formal communication from the poetic politician. Mr. Kakoma, however, said the UPND was not going to find out from Dr Banda as was reported in the media but would wait for the former vice-president to submit his resignation letter. “As far as the UPND is concerned, Dr Banda is still a member of the UPND and remains the vice-president for political affairs. We have not received any letter from him informing the party that he has resigned and we are treating the reports as nothing but poetic social media commentaries. However, we are not going to look for Dr Banda so that he can hand in his resignation letter,” Mr Kakoma said. Mr Kakoma said as far as the UPND was aware, Dr Banda was suspended and was asked to exculpate himself within seven days. He stated that Dr Banda had not yet exculpated himself and was, therefore, still an effective member of the UPND. But Charles Malembeka, a representative of Dr. Banda has challenged the UPND to stop playing games with Zambians and challenged the opposition party to come out and confess over the resignation of their vice-president. Mr. Malembeka said Dr. Banda’s resignation letter was delivered to the UPND secretary general Stephen Katuka who had acknowledged receipt. He said the UPND leadership should be careful with the manner they were going to handle the resignation of Dr Banda because as vice-president, he was a key member of the opposition party. “From the office of Dr. Banda (Pilgrim) because he is no longer UPND vice-president, we are saying that the UPND should not behave like kids and we expect them to show leadership so that we can learn,” Mr Malembeka said. Mr Malembeka said Dr. Banda was allegedly in possession of pictures of Mr Katuka receiving the letter when it was delivered at his residence on Wednesday.